Leave ordinary life behind and step into the unparallel grandeur known as Ponte Vista. 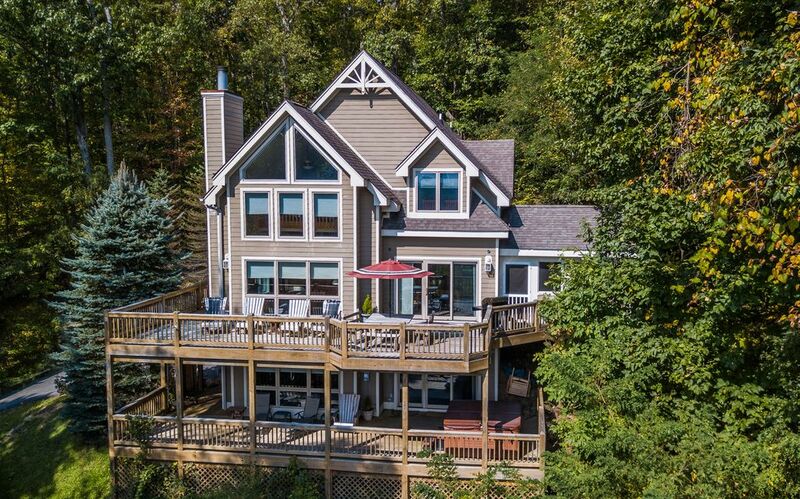 This 5 bedroom mountain home boasts elegant decor and breathtaking panoramic views. Mix in 2 native stone fireplaces, a gourmet kitchen that has every imaginable appliance needed for fine dining, an open and spacious layout, and you have a vacation home that will leave a lifetime full of memories. After a fun-filled day of skiing at Wisp, located a short drive away, come home and relax in the steaming hot tub. The summertime will find you docking and swimming from the provided nearby dock or grilling from the expansive wraparound deck! The Spring and Fall will enthrall with the spectacular greenery and foliage our mountains provide. Call today to reserve your stay in the beautiful mountain chalet. For your convenience, this home offers free wifi. Hot Tub & Dock Slip! Perfect Winter Wonderland For 5 Couples! We really enjoyed our time...couldn't have asked for a better choice to host our couples retreat getaway! This house was great, very clean and well kept. Enough Room for everyone. The House isn't directly on the lake, rather across the street. Since it's sits high on the mountain you still have a beautiful view of the water. It was just down the street from Wisp which was extremely convenient for our winter weekend. Would highly recommend, looking forward to our next stay. Wonderful time in a comfortable house! Stayed in Ponte Vista this past weekend with a group of friend and had a lovely time. The house was warm and very homey. We had everything we needed in the kitchen and lots of games to play. The grill was very dirty, we called Property Management and they quickly came by and gave us new grilling tools to clean with. The bed pillows need to be updated and the upstairs couches had very flat pillows, not very comfortable. The hot tub was spot on and we spent a lot of time in the it - given the chilly weather. All in all, was a great experience and we would definitely stay at this home again.